Back to the original topic. You could make it as 3 different stations: with roof (where the end tile has the nice end at the edge of tile like now), special transition (has end of roof everywhere), and just platform. True. However the best thing would now be if that extension request could perhaps be implemented! 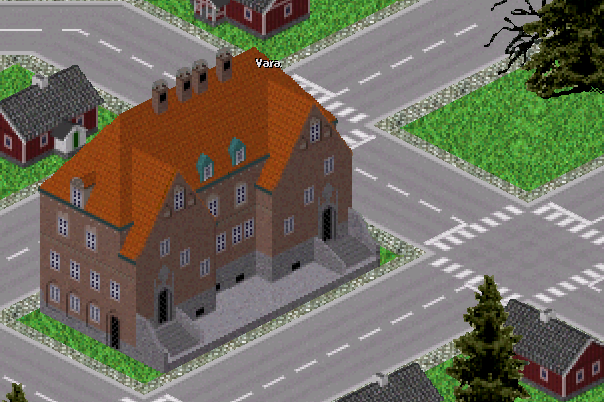 Meassuring 4 x 3 tiles, I guess this city hall should be for a rather big city. The real Östersund has ca 50.000 inhabitants (wikipedia) which would count as a medium sized city in Sweden, so I wonder wether we need another city hall that is even bigger? Anyway, that question will remain until potential new inspiration shows up! The building is built of modules, which can be rearranged. I have painted one additional set of "endcaps" and a smaller terrace which currently is used on the smaller cityhall (meassuring only 4 x 2 tiles). I figure that one could perhaps squeeze one more city hall out of the graphics, but it should either be smaller (or bigger for that matter....) than the now two existing ones. I do anyway plan on painting one big middle section, which could be used together with the endcaps to create a building without the tower, however, that would need something else interresting instead. If anyone see any inconsistence, for instance a reversed shadow, please let me know, since there are alot of details that one can overlook. Really nice. I think this is big enough for even the biggest town. 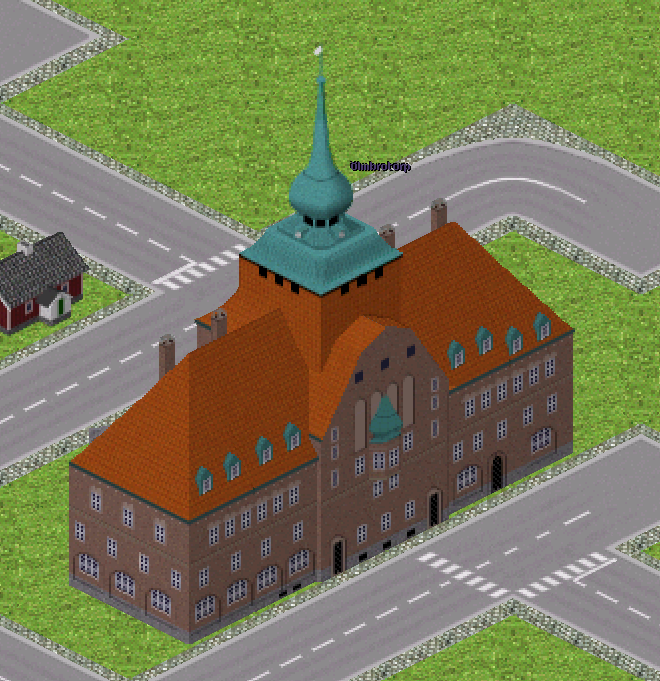 Although in reality big cities have city hall split into more buildings, and even separate city halls for each part of the city. 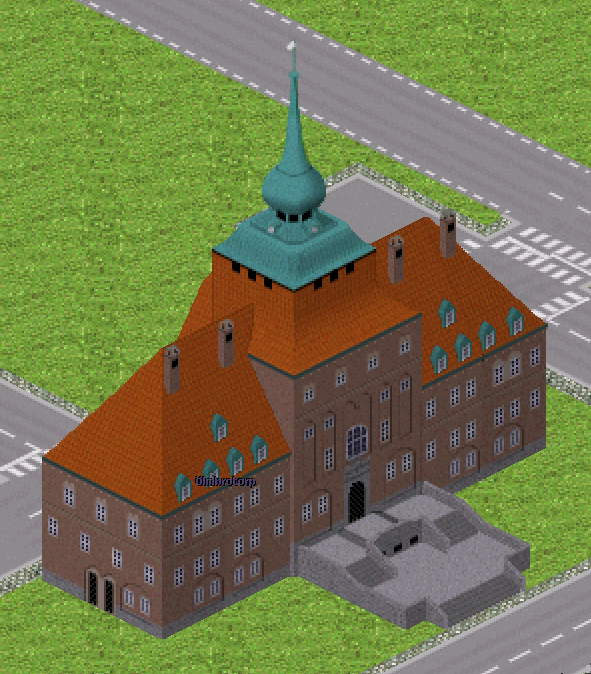 For smallest towns you could use one of the side wings as a town hall, then the main building (perhaps without tower and later with tower), and the complete thing for the biggest towns. Thank you. I kind of agree that it would not make much sense to make an even bigger one, as this is quite big indeed! I created this small little bugger using the two wings. I modified it slightly by adding windows between the two new (very very small) wings, which will now show up on the big house as well. I know there is no clock, which I believe should be on basicly all townhalls, I might make a frontimage clock that one can put onto the building. What do you think of the step up to the terrasse, does it look stupid? Either there should be stairs from road to the terrace, or it should be at the same level as road. Also there should be a paved path from the side doors to the edge of tile. That small strip of grass looks funny. I have not yet painted a pavement, the one you see is the one from normal pak.128 I believe. 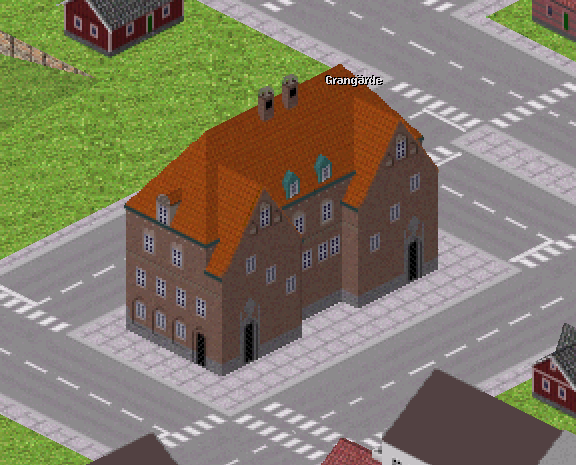 When I come around to do that, all buildings, which are supposed to have pavement, will get that. Thanks, I will rethink a bit how the terrace is painted (it is kind of "hard painted" at the moment), and see what I can come up with. So, now it is possible to build all tiles of the house without the terrace in front of it. Hmm, perhaps add back the staircases to the main entrances. They look too high now. I think I will put variations in the pavement tiles on the bigger cityhall eventually, like sprinkle water or shrubberage. Does the small house still needs stairs? I made the doors taller to make them more "entrence like" and minimizing the gap between the bottom floor and second flor. Speaking of bottom floor, it looks very empty in the small city hall. It is designed in a way so I can draw whatever I want below the second floor windows, as that will be covered by the terace graphics, however I cant really decide on what to draw. What do you think?